Omega’s AIM Tutoring System® has helped tens of thousands of students achieve tutoring success. With over a decade of validated results, Omega Learning® Center provides an exclusive and comprehensive solution to help families achieve their long and short-term academic goals. In addition to performing remediation and filling skill gaps, we teach study skills, and evaluate standards mastery to prepare learners for high-stakes exams. APPLY – Omega tutors work on enrichment objectives to help their students build critical-thinking skills needed to apply the basics of reading and math to more advanced concepts. 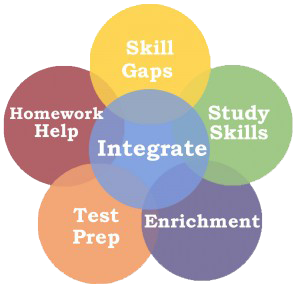 INTEGRATE – Omega tutors integrate five key academic objectives throughout the tutoring program based on each student’s individual needs each week. MANAGE – Omega Learning® Center’s exclusive software system provides its tutors with our OutpAce® supplemental curriculum, progress management tool, and communications platform. Omega’s tutors share important daily progress updates with all members of your student’s “Academic Team,” including parents and schoolteachers.